Dwarf Red Jade vine. If you always wanted to own THE Red Jade Vine, here is your chance! Also called Cuitelo, Crista-De-Galo (Rooster's Crest), it is sometimes miss-identified as a Mucuna species. This amazing eye-catcher is closely related to Red Jade Vine, however, it is much hardier than the ultra-tropical Mucuna benettii! 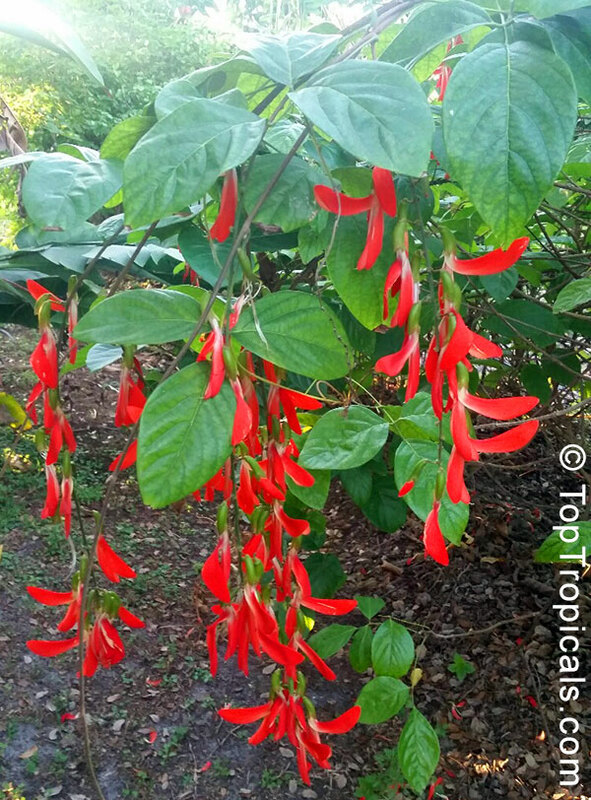 It is a spectacular fast-growing vine from Brazil with long pendulous chains of fiery bright red flowers. Heavy vine, it needs large trellis or pagoda. An arbor is ideal so that the brilliant flowering racemes can hang down from the ceiling. Blooms in fall and winter. Prune heavily in spring after flowering. Give full or partial sun with adequate moisture and fertilizer. It is very easy to grow, can tolerate some drought and light frost.